Average monthly sales of e-cigarette products rose 132 percent from 2012 to 2017. Sales of e-cigarettes and similar vaping products have soared over the past five years as prices for them have fallen, federal health researchers reported Thursday. Taxes help keep sales down, the team at CDC’s Office on Smoking and Health reported in the journal Preventing Chronic Disease. They said their findings can help inform state and federal decision makers, who are trying to decide if e-cigarettes are a blessing, a risk to public health, or both. 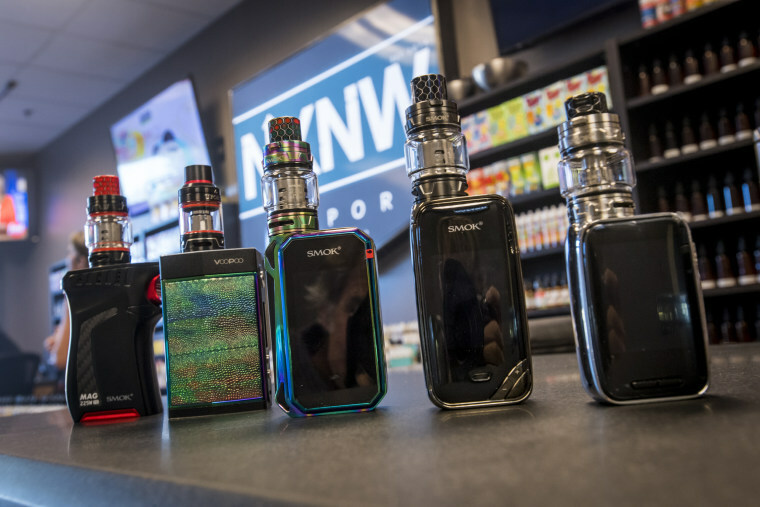 “Overall, U.S. e-cigarette unit sales generally increased as product prices decreased,” wrote the team, led by Teresa Wang of the CDC. “By state, average monthly sales significantly increased for at least one of four e-cigarette products in all 48 states and Washington, D.C.,” they added. Overall, the average monthly sales of e-cigarette products rose 132 percent from 2012 to 2017, they found. The Food and Drug Administration is considering just what, if anything, to do about e-cigarettes and other products. Separately on Thursday, FDA Commissioner Dr. Scott Gottlieb and Mitch Zeller, who directs the FDA’s Center for Tobacco Products, said in a joint blog post that the agency was preparing a new product standard for e-cigarettes. The FDA worries that e-cigarettes might deliver harmful chemicals and that they might addict a new generation of young people to nicotine. “We’ve already announced several vigorous enforcement actions and education efforts aimed at addressing youth use of nicotine, and e-cigarettes in particular. More such actions are imminent,” Gottlieb and Zeller wrote. The FDA cannot outlaw tobacco products but has the power to regulate new products coming onto the market. The CDC team used retail scanner data from the 48 contiguous states and Washington to analyze sales and prices of e-cigarette products from 2012 to 2017. Sales of rechargeable products rose 154 percent while their prices fell 48 percent, the team found. Sales of disposables rose 27 percent as prices fell 14 percent. They found that sales of pre-filled cartridges rose 256 percent while prices fell 12 percent, and sales of e-liquids rose 64 percent with no change in price. “E-cigarette use increased 900 percent among U.S. high school students from 2011 to 2015, and e-cigarettes surpassed conventional cigarettes as the most commonly used tobacco product among this group,” the CDC team noted. “The prominent use of e-cigarettes among U.S. youth has been attributed in part to the heavy marketing of these products with youth-resonating themes, as well as the widespread availability of youth-appealing flavors." In January, the National Academies of Sciences, Engineering and Medicine issued a report saying that e-cigarettes may be a less dangerous way to use tobacco, and may help established smokers reduce their immediate risk of death and disease, but they can hook teens and young adults and raise their risk of becoming smokers.